Design isn't your skill set? It is for us! Here's how it typically works: You'll email us a Word document with your paragraphs, and indications of where you would like the photos, charts and graphs. You'll attach your photos and Excel files too. If you have a PowerPoint presentation, send that. We'll put all your information into one of our templates and get everything lined up and looking good. We'll send you back a PDF proof, usually within a day. Tell us what needs to be changed, if anything. We'll go back and forth until you have something that you are happy with. When you approve the final design, it is printed in our normal lead time. 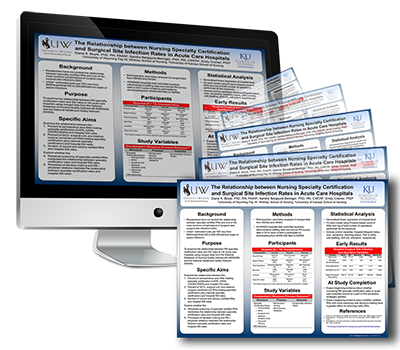 We are able to ship scientific posters the same day when approvals are received before noon (Eastern Time). It usually takes an hour or two of design time, and we charge $100/hour. Or, ZIP your files into a single .zip file and enter an online order, asking for design help in the special instructions. This will not price the design time, but expect $100-200 of design charges.